On the road. Drawing birds. See? I am posting again. A little study for a painting I am working on. Ink and watercolor on gray paper. Arizona. A brief intro, of sorts. Still alive here, if a bit reclusive. Here are a few quick sketches I did in preparation for a Super Cool Gig that I have just (pretty much) wrapped up. I’m doing a heckofalotta work at the moment, but none of it appropriate for public displays – yet! 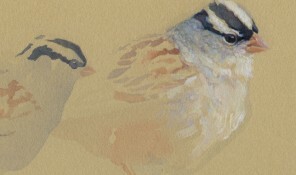 Adult White-crowned Sparrow studies (Zonotrichia leucophrys leucophrys). 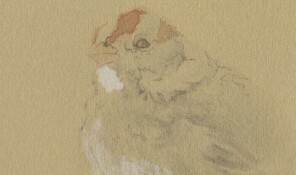 Watercolor, gouache, and ink on tan paper, 11 x 7.5″, 2011.